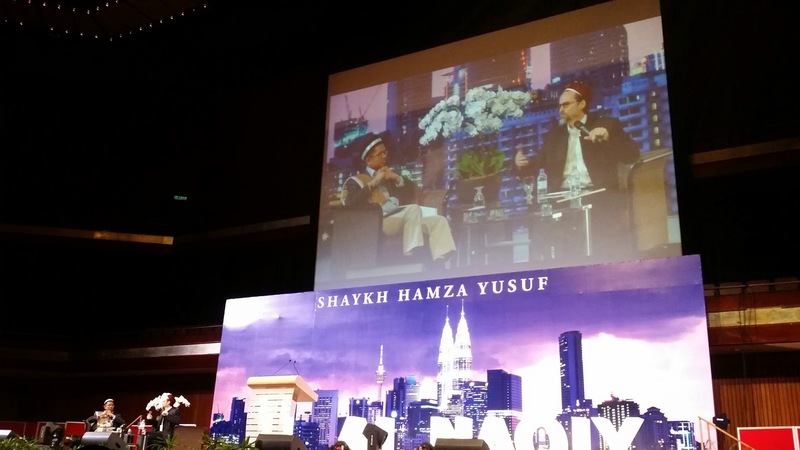 Shaykh Hamza Yusuf is a contemporary American Muslim scholar who has inspired many people, particularly Western (or Westernised) Muslims who can relate to the issues highlighted in his books, classes and speeches. I attended one of his events in Kuala Lumpur last night. It was a lecture entitled "Global Tawbah" and he addressed several concerns in relation to the modern Muslim world and ummah. I have come across individuals who say that religion is the root of evil because it has caused many wars and atrocious acts. I admit a lot of terrible things have happened in the name of God and religion but a lot of wonderful things have happened in the name of God and religion too. Do they not count for something? We cannot make a blanket statement like that without considering the other side of the argument and which one makes more sense. And what about agnostics or atheists who commit crime and violence? What would be their reason? The act of tawbah, repentance or turning to God, is one of the most integral aspects of being Muslim. As humans we are driven by our ego, lusts and emotions. Yes, Allah (swt) created us with these qualities but He also created us with intellectual capabilities so we may we able to practice self-control. 1. To build and cultivate the Earth. 3. To adore Allah (swt) through the 'aql (intellect), not merely through naql (revelation / evidences). Therefore, what happens when we lose our sense of purpose or have a misguided idea of it? "The destruction of civilisation and the civilisation of destruction." When we allow our ego and lusts to take over our minds and bodies all Hell breaks loose on Earth. It frustrates me that I am doing almost everything I can to become a better person only to have misfits and terrorist organisations ruin the image and sanctity of the very thing that inspired me to become a better person. How do we fix a broken world? I wish I had the answer to that question. Maybe we should start by tending to our hearts, first and foremost. I also think Saint Augustine was clearly on to something when he said, "Since you cannot do good to all, you are to pay special attention to those who, by the accidents of time, or place, or circumstances, are brought into closer connection with you." Prophet Muhammad (saw) did say that a Muslim is one whose tongue and hands others are safe from. Perhaps it would also be to always turn ourselves towards Him when we lose our way. "Beautiful patience, and our help is with God."